The Virtual Supermarket is a 3D computer model of a real supermarket that we started developing some years ago. When we first published on the Virtual Supermarket topic , there were highly variable reactions ranging from people willing to spend a significant sum of money to use the tool, to reviewers wondering whether it is anything more than a game. In this blog post we look at some recent research on this virtual reality approach and attempt to answer the question – what is the allure of a virtual supermarket for public health nutrition research? Maybe the best place to start answering this question is the original reason as why we built the Virtual Supermarket: to test food pricing strategies. Most people will have heard of this public health intervention in the form of fat tax, sugar tax, soft drink tax or similar policy. The idea behind these taxes is simple and goes back to one of the fundamentals of economic theory – if you increase the price of a good, demand will decrease and vice versa . So, if we want people to eat less unhealthy foods, we increase the price, “problem solved”. Apart from any practical concerns, the effectiveness of food taxes is highly uncertain. The biggest issue being so-called cross price elasticity effects. Let me explain – if you increase the price of sugary drinks, we expect people will buy less sugary drinks. But, maybe, people like their sugary drinks so much that they keep buying them, leaving them with less money to spend on other foods (no money left for broccoli!). The same applies to subsidies. If you make fruit and vegetables cheaper, people might buy more of them. But, chances are, they spend the money they saved from the cheap produce on other (unhealthier) products (I can have chocolate after I eat my broccoli) [3,4]. Now, the question is how to study taxing effects properly. Any public health scholar will know that randomised controlled trials are the gold standard. Here we mean an experiment where one group of people is exposed to the intervention (say a soft drink tax) while the other group is not (the control group). There are a few of such studies present in the literature. Simone French pioneered much of this work in the US where she tested several pricing strategies in high-school cafeteria and vending machines . However, a major limitation of these studies is that they did not look into cross price elasticity properly. Vending machines have only a limited number of options and don’t allow testing how changing soft drink prices impact on broccoli consumption. Now, here it becomes tricky. Supermarkets are not queuing up to open their store for a fat tax experiment. Particularly, when only some stores will get a fat tax, while others don’t. Consequently, supermarket pricing trials are very scarce and limited to studies testing subsidies (i.e., clearly, supermarkets have less concerns about introducing discounts on healthy foods, especially when researchers pay for them) [6,7]. 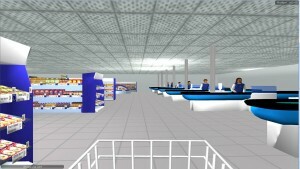 The Virtual Supermarket is a 3-D computer simulation of a real supermarket. It has images of all products you would normally find in a supermarket located on 3-D shelves. People can navigate their trolley around the store and purchase products with a mouse click. The cool thing is, we can manipulate this environment. We have conducted numerous of such trials already, all providing important new insights into food pricing strategies [8,9]. Originally developed in the Netherlands – we now have a NZ Virtual Supermarket and a UK version in the making. How realistic is the Virtual Supermarket? Now the million dollar question is, how realistic is the Virtual Supermarket? Can people really use it? Do they not see it as a game instead of a serious task? To figure this out, we asked 123 NZ shoppers to complete 3 shops in the Virtual Supermarket and collect their real-life grocery receipts during 3 consecutive weeks. Then, we compared their virtual and real groceries across 18 major food groups. The paper just recently got published in the Journal of Medical Internet Research . Result – the purchases were very similar. Expenditures within the biggest and smallest food groups were the same in the Virtual and real supermarkets. Also people felt a high level of presence in the Virtual Supermarket, which means they could well imagine themselves doing real shopping. This makes sense as evidence from other fields has shown that virtual environments are frequently used to improve surgical technical skills, as a therapeutic instrument in clinical psychology, and in the treatment of several phobias. Is the Virtual Supermarket the perfect tool? No – it must be noted that we observed some differences between the virtual and the real shops. Of the 18 studied food groups, 3 groups showed important differences including ‘fruits and vegetables’, ‘dairy’ and ‘snacks’. We are now working to further improve the software to accommodate future trials. Also, the Virtual Supermarket does not have cool features such as avatars and people do not pay with real money or receive real groceries. All great ideas to work on! Can the Virtual Supermarket provide much needed evidence to inform public health policy? Definitely yes in our view. Without real-life case studies, virtual experiments are as close are we are going to get. While the external validity might not be 100%, the internal validity is a lot higher compared to real-life experiments. In the Virtual Supermarket, we can control every single factor (price, promotions, placement, etc.) – which is really tricky in the real world where thousands of things are going on in a supermarket. Results from Virtual Supermarket trials can be the step between having no evidence and setting up real-life trials. Also, very importantly, the tool allows academics to conduct trials without needing co-operation from food industry. This protects their integrity and objectiveness. We are still working on improving the software – and of course working in public health, limited funding means the tool is not as fancy as we’d like it to be. But building on what we already have and by starting new collaborations we hope to create something that is useful for many academics when testing interventions in a complex environment. Ultimately this means that when a Government wants to explore nutritional policies to advance public health – there will be high quality experimental data to inform decision-making. The author would like to thank and acknowledge Professor Cliona Ni Mhurchu who initiated the Virtual Supermarket validation study and obtained funding through the University of Auckland Faculty Research & Development Fund for this study. Thanks also to Professor Ingrid Steenhuis with whom I developed the original idea for a Virtual Supermarket for public health nutrition research. The Virtual Supermarket software is developed by SURFsara Amsterdam (funded by the VU University Amsterdam), with particular thanks to Tijs de Kler for making the tool in the great shape it is today. Waterlander WE, Scarpa M, Lentz D, Steenhuis IH. The Virtual Supermarket: An Innovative Research Tool to Study Consumer Food Purchasing Behaviour. BMC Public Health 2011; 11(1): 589. Perloff JM. Microeconomics. 4 ed. Boston: Pearson Education; 2007. Andreyeva T, Long MW, Brownell KD. The impact of food prices on consumption: a systematic review of research on the price elasticity of demand for food. Am J Public Health 2010; 100(2): 216-22. Waterlander WE, Steenhuis IH, de Boer MR, Schuit AJ, Seidell JC. Introducing taxes, subsidies or both: The effects of various food pricing strategies in a web-based supermarket randomized trial. Prev Med 2012. French SA. Pricing effects on food choices. J Nutr 2003; 133(3): 841S-3S. Ni Mhurchu C, Blakely T, Jiang Y, Eyles HC, Rodgers A. Effects of price discounts and tailored nutrition education on supermarket purchases: a randomized controlled trial. Am J Clin Nutr 2010; 91(3): 736-47. Waterlander WE, de Boer MR, Schuit AJ, Seidell JC, Steenhuis IH. Price discounts significantly enhance fruit and vegetable purchases when combined with nutrition education: a randomized controlled supermarket trial. Am J Clin Nutr 2013; 97(4): 886-95. Waterlander WE, Ni Mhurchu C, Steenhuis IH. The use of virtual reality in studying complex interventions in our every-day food environment. In: Tang X, ed. Virtual Reality Human Computer Interaction. Rijeka, Croatia: InTech; 2012: 229-60. Waterlander WE, Ni Mhurchu C, Steenhuis IH. Effects of a price increase on purchases of sugar sweetened beverages. Results from a randomized controlled trial. Appetite 2014; 78C: 32-9. Waterlander WE, Jiang Y, Steenhuis IH, Ni Mhurchu C. Using a 3D Virtual Supermarket to Measure Food Purchase Behavior: A Validation Study. J Med Internet Res 2015; 17(4): e107.